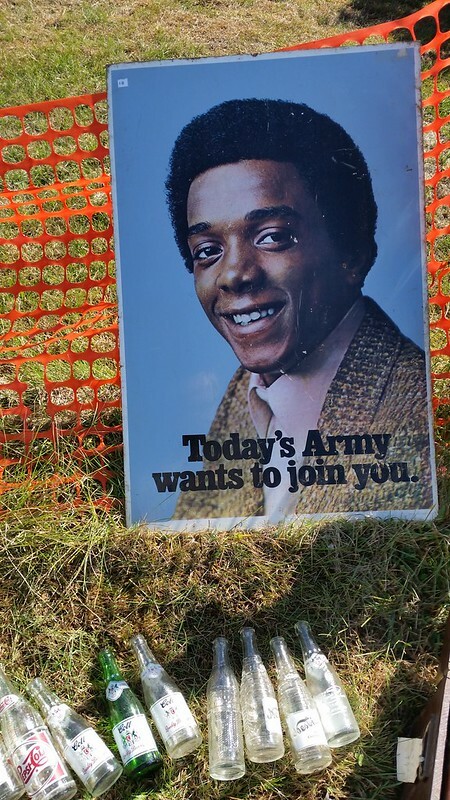 A poster of an African American with a message, "Today's Army wants to join you." leaning against a mesh fence with some empty bottles in front of it. This poster is fascinating. First is the slogan, "Today's Army wants to join you" which I didn't know was a major slogan of the Army in the 1970s. I was raised on "Be all you can be." But what is most striking is of course, the use of an African American. It's clear that the army was trying to diversify, but the choices around presenting an African American and what it communicates is curious. It makes me wonder what demographic of African Americans the Army is trying to seduce. The image has all sorts of markers about who the suggested audience should be, because it doesn't seem to indicate all African Americans but those of a certain class or distinction. After all, how many people in general--never mind African Americans walk around in a pink collared shirt and tweed jacket with well-kept hair? It was a curious artifact to stumble across at a giant flea market and wonder about the decisions made to manufacture it.